By far one of my favorite strains that is usually so consistent in helping me through the day. I love blue dream, It's relaxing, but a remain productive. One of my favorites. This is a smooth yet potent strain. I always have at least one plant in all my grows for personal use. 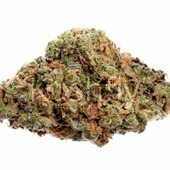 In my opinion, it is not the smelliest or stickiest weed around but the punch is what counts and this strain delivers in spades! If I want to relax at the end of the day without getting knocked out, Blue Dream is one of my first choices.